The compelling hero of this southwestern suspense novel is 29-year-old Detective Maria Chavez who investigates the brutal murders of two innocents in the barrio with a tenacity that is both personal and professional. As she and Border Patrol Agent Joe Carter search for answers, they find themselves drawn inexorably into the shadowy world of the area’s largest criminal cartel, an organization that runs dog fights, distributes drugs, and preys on those who enter the country illegally in search of a better life. When a child witness disappears, Maria and Joe race from the back rooms and squad cars of an urban police department into the borderlands scarred with smuggling trails. The book’s deeply layered and provocative portrait of the dark underworld along the Mexican border is as riveting as the fast moving plot that takes a number of intriguing and unexpected turns. Maria and Joe become increasingly involved in the desperate life and death struggles of illegal immigrants whose flight north side snares them in the nets of the cartels. At the same time, Maria finds herself unwillingly pulled into a parallel search for clues to her early life as an illegal immigrant. Her intensely personal relationship with Joe Carter and the startling revelations that come to light about her own desert crossing ultimately force her to confront the dark puzzle that has haunted her life since childhood. Choose from a social networking link below to spread the word about The Lady in Blue! 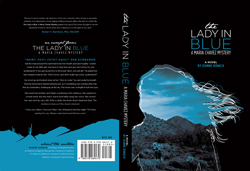 Jeanne’s book, The Lady in Blue: A Maria Chavez Mystery, is now available on Kindle! Visit Amazon.com to purchase the book or the Kindle edition. You can also read the Kindle edition on your iPad or smart phone!